QUINCY, FL (October 16, 2018) – When a community is impacted by a disaster, survivors are seeking simple comforts such as a hot meal, a cup of coffee, and a friend to talk to. The Quincy community, just northwest of Tallahassee, got a savory surprise yesterday as The Salvation Army, Crossroad Academy Charter School of Business, and Community Coffee partnered to host a barbeque-style feeding site for families affected by Hurricane Michael. “We have two low-income housing communities right by the school. When a disaster like this happens, trying to get a meal is just another grocery bill these families did not plan for. By partnering together, we are expanding our resources for these families,” said Crossroad Academy Principal Kevin Forehand. Crossroad Academy, which provides a rigorous educational program for more than 550 students, is still without power. Sean Kirby of Community Coffee also donated an abundance of fresh, hot coffee to serve at the event, which many survivors in the community were grateful for. Sean has been an Advisory Board member for The Salvation Army in Baton Rouge for almost 15 years. 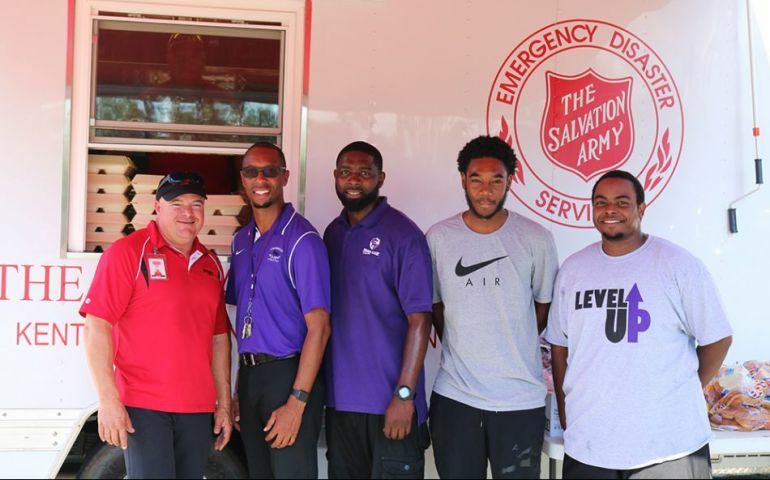 Just three weeks ago, Sean and his team drove out to the Carolinas to enhance The Salvation Army’s disaster response for Hurricane Florence. This time, Community Coffee joined forces with The Salvation Army again to serve alongside them in Tallahassee and Panama City for Hurricane Michael. “We love helping The Salvation Army. Their emergency response is well orchestrated, and I love their passion,” said Sean. Between the meals prepared on The Salvation Army’s canteen and those prepared on site by the school’s Chief of Staff and Students, more than 3,400 hot meals were available for the Quincy community, including hot dogs, hamburgers, and barbeque sandwiches. Friends of The Salvation Army, including State Representative Ramon Alexander, were onsite to meet with survivors and first responders. DJ Dap and DJ Ezone of Tallahassee’s Blazin 102.3, also came out to further broadcast The Salvation Army’s efforts to meet the need of people impacted by Hurricane Michael in Gadsden County.